One lucky reader recently joined Claire Gillo in the Lake District for a series fun photo challenges. Jennifer was loaned a Nikon D850 and a series of lenses by London Camera Exchange, but how did she get on? Let's find out. Jennifer has photography in her blood. Her father was a semi-pro who carried out photography for the armed forces as well as exhibiting his non-military work. 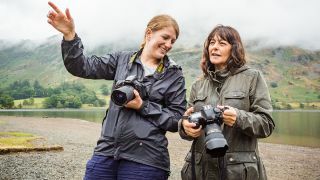 After holding down a regular 9-5 job at Intel, Jennifer decided to follow her dream and became a freelance photographer, specialising in documentary photography. As well as providing images for editorial, commercial and private commissions, she assists Singapore- based photojournalist Edwin Koo and co-ordinates KIO International Photography Masterclasses in Nepal. You can see more of her work here. Despite the majority of the UK being desiccated by a record summer heatwave, we were greeted by two days of drizzle and downpours in the comparatively verdant Lakes. The grey light and featureless skies, plus a relentless curtain of rain, meant that a different approach was required to capture the landscape – something that Jennifer, who has a keen interest in documentary photography rather than classic landscapes, was keen to explore. Jennifer opted not to use a tripod, which certainly made it easier to duck in and out of cover when it rained. Increasing the ISO and bracing against a sturdy structure helped to give sharp results in the dull light. We’d initially planned to hike up to the top of Cat Bells to photograph the view across Derwentwater, but there wasn’t much of a view visible through the rain. So we made the short trip down to our first lakeside stop, Hawes End Ferry Landing. We had the place pretty much to ourselves apart from a few ducks and swans; as a ferry sliced through the murk, Jennifer lined up this frame. Expert opinion: We love the curve of the shore and branches that lead the eye to the boat in Jennifer’s composition. We’d be tempted to clone out the bright stone at the bottom of the frame, though. The jetty at Ashness Landing – on the opposite side of Derwentwater to Hawes End – is one of the most iconic spots in the Lakes. Landscape photography isn’t the laid-back affair some people might expect it to be. It can be a bit like wildlife photography, with nothing happening for ages before there are a few fraught seconds where everything’s happening at once. The key is to know how to quickly adjust your camera settings to take advantage of sudden changes in light. A quick Google Images search rakes in thousands of images of the jetty taken in sublime conditions. We didn’t hold out much hope as we made the drive around the lake, but after we’d up for another greyed-out jetty shot, the warm evening sun surprised us by piercing the clouds... but not for long. “It stopped raining for what seemed like only seconds, then we had this moment of light – hallelujah!” enthuses Jennifer. “I zoomed the lens out to 14mm to include the whole scene. Shooting handheld, I took the shutter speed down as low as I dared, to 1/80sec. I could have gone slower still with this wide lens, but I didn’t want any risk of camera shake spoiling a few precious seconds of the sun’s appearance. Expert opinion: Jennifer’s dark, dense treatment, along with that sunburst, captures how it felt on the day. But perhaps the foreground detail could have been brought out a touch more in post-production. Our initial plan for the next morning was to hit the road by 4am so that we could be on location to capture a glorious sunrise. But the weather was having none of it! In the end, we headed to a couple of locations to capture a few more rain-soaked scenics and detail shots. With blue-sky days, there’s always a risk that scenics will end up looking a bit ‘chocolate boxy’. We didn’t have that problem. The cameras shrugged off the rain, although we sought cover where possible, while lens hoods provided a surprising amount of protection for the front elements. Waterproof trousers and boots were essential for low-level shots. Jennifer was kitted out in suitable gear for the conditions, which meant that she didn’t shy away from trying different camera angles – including low-level shots like the one above. “I wanted to frame the scene as best as I could while handholding the D850 with the 14-24mm lens mounted,” says Jennifer. “Holding almost two kilos without a tripod, I took this shot at 1/2,500sec to reduce the chances of blurred shots caused by camera shake, although I realise this shutter speed would be excessive for many people. Expert opinion: Jennifer is right about the shutter speed – but everyone’s mileage varies when it comes to avoiding camera shake. Besides, the D850 gives excellent quality at ISO 640. The choice of black and white suits the almost monochromatic scene, and the breaking wave is a nice detail that adds a literal splash of contrast.